The Easiest Chocolate Chunk Oatmeal Cookies made with all gluten-free, egg-free and dairy-free ingredients for a quick and easy healthy oatmeal cookie recipe! There is no such thing as too many cookie recipes. Especially during baking session aka right now. Except I have been in baking session for the past three months testing all the holiday cookies and treats for you guys! 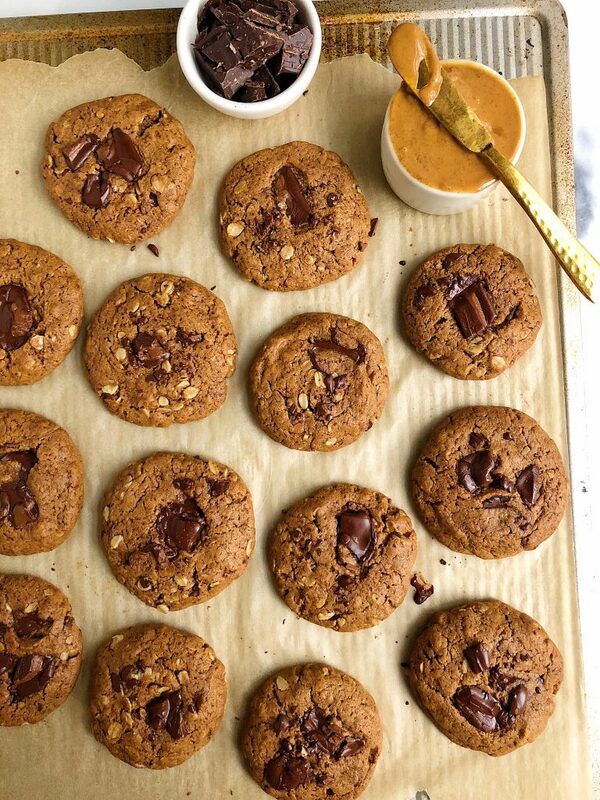 I love testing new recipes for you to enjoy and whip up, but I also love putting a healthy spin on a classic like we are in these Chocolate Chunk Oatmeal Cookies. They are the easiest oatmeal cookie ever to make and they’re gluten-free, egg-free and have no refined sugar in them (heck YES!). I also add an extra boost in these cookies with collagen peptides. 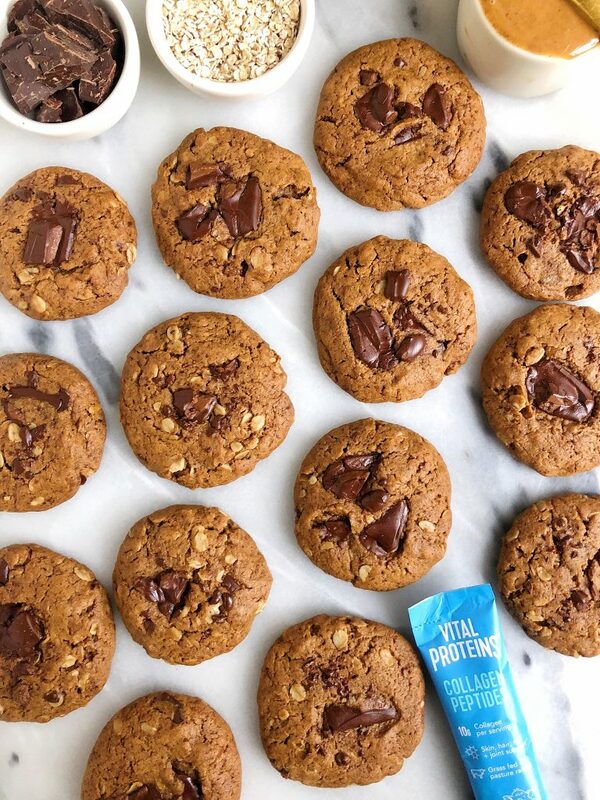 You guys know how much I love to sneak collagen peptides into my recipes, especially baking! It dissolves right into the batter, doesn’t add any taste and you are get to add extra protein and collagen to the treat. If you are scratching your head wondering what collagen peptides are, check out this blog post here! I use Vital Protein’s collagen (it is my favorite) and now I can gladly feast on this batch and get my extra nutrients in. These cookies are made with a few simple ingredients and they are a great option for anyone who has a gluten, egg or dairy allergy. We are using ingredients like creamy almond butter, gluten-free oat flour and sprouted rolled oats to make them! No refrigeration necessary for the dough so the cookies are ready in 15 minutes start to finish (including the making of the dough!). I cannot wait to hear what you think of these Chocolate Chunk Oatmeal Cookies. Don’t forget to tag me on Instagram if you make them and dip them in some coconut or almond milk to make them even more dreamy. Here are a few of my other favorite recipes on the blog using collagen peptides: 4-ingredient Blueberry Collagen Jam, Paleo Pumpkin Chocolate Chip Bread and Homemade Paleo Bread. Allow the cookies to cool for 10 minutes then remove from tray and enjoy! Will stay good in airtight container for 5 days or freeze for up to 2 months! Thank you Vital Proteins for sponsoring this post! It means so much to me to partner with brands I love and believe in on the blog! Can this be made with sunflower butter? 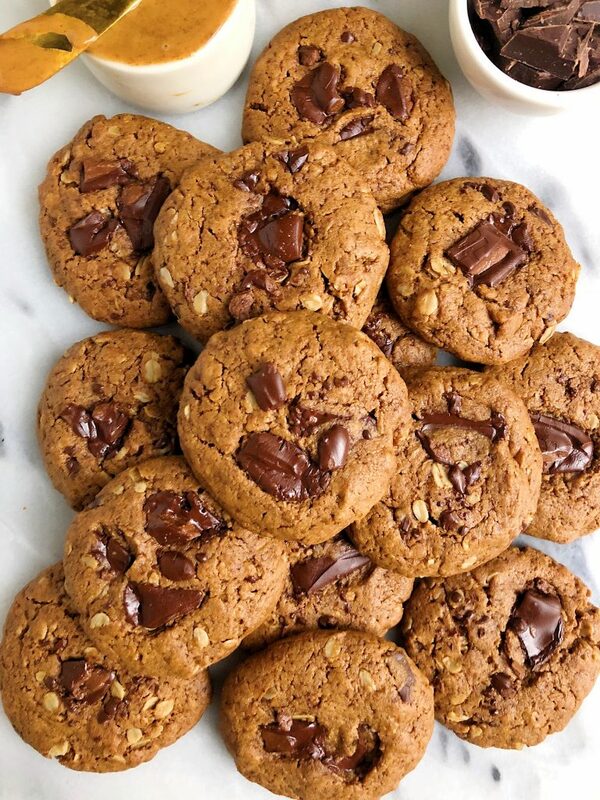 Could you sub the chocolate and make these an oatmeal raison cookie? Can you use maple syrup instead of coconut sugar?